Miami real estate agents have one reason to be happy – Brazilian buyers are back as a dominant buyer pool in South Florida, amid an increase in foreign investment. Political turmoil in Brazil and a strong dollar have kept buyers away from South Florida in recent years – until now. 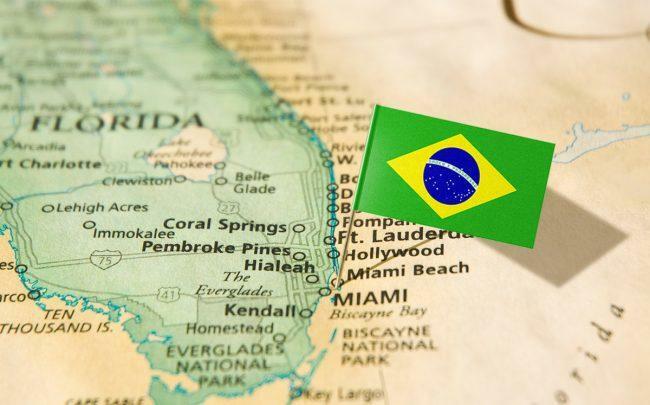 Brazil ranked as the top country buying South Florida homes in 2018, according to a new report from the Miami Association of Realtors. In 2018, international buyers spent $8.7 billion on residential properties in Miami-Dade, Broward and Palm Beach counties, up 22.5 percent from $7.1 billion in 2017. Foreign buyers acquired 14,300 homes in 2018, 1,000 or 7.5 percent fewer properties than the previous year, according to the report. Brazil ranked No. 1 for the first time since the association began tracking foreign investment in 2012, representing 12 percent of all foreign purchases of homes in the tri-county region last year. Colombia and Venezuela tied for the second spot with 11 percent, each, followed by Argentina and Canada with 8 percent each. Mexico, France and Italy tied with 4 percent, each; and the United Kingdom, China, Peru and Ecuador had 3 percent, each. In 2017, Argentina topped the list, followed by Venezuela, Canada and Colombia. Foreign investment in residential real estate in the tri-county area in 2018 represented 54 percent of all international sales in Florida, which ranks as the top state for such investment. Orlando was the second market for international sales with 9.4 percent of sales in the Sunshine State. South Florida represents about 9.5 percent of all U.S. international home sales, according to the report.